An all-in-one multimedia bulk wire for voice, video and data with just one pull! Here is a complete cable bundle designed for whole house access to voice, video and data transmission. By pulling multiple telephone, coaxial and fiber cables as a single bundle instead of separately, you greatly decrease installation time and cost. 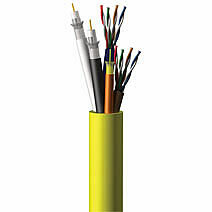 This high-performance cable has all the cables you need for in-home multimedia applications: (1)Two RG6 quad-shielded coaxial cables for satellite/video use; (2) Two Cat5E UTP cables for voice and data applications; and (3) Two FDDI simplex multimode fiber cables for future handling of video and data. With an overall jacketed cable assembly, this composite cable has an outer diameter of 0.67in. Ideal for installation in existing structures.